Gather round! Cluster engagement rings are where the sparkle’s at. An alternative to the traditional solitaire style setting, cluster engagement rings take a more holistic approach to sparkle. Multiple smaller diamonds are combined to create the illusion of a much larger stone, giving you more bling for your buck. Depending on the ring, these smaller diamonds will either surround the center stone or congregate in the center, taking its place. The individual stones have a lower carat weight than a regular-sized center stone, making cluster engagement rings less expensive overall. Deep down, we’re all suckers for sparkle. The more light a diamond returns to our eyes, the more tingly we feel inside. We’ve rounded up the finest clusters we could muster… so go ahead and pick your luster! Bejewel your partner’s hand with this Grande Floral Engagement Ring, which features shimmering petals around a central diamond bouquet. 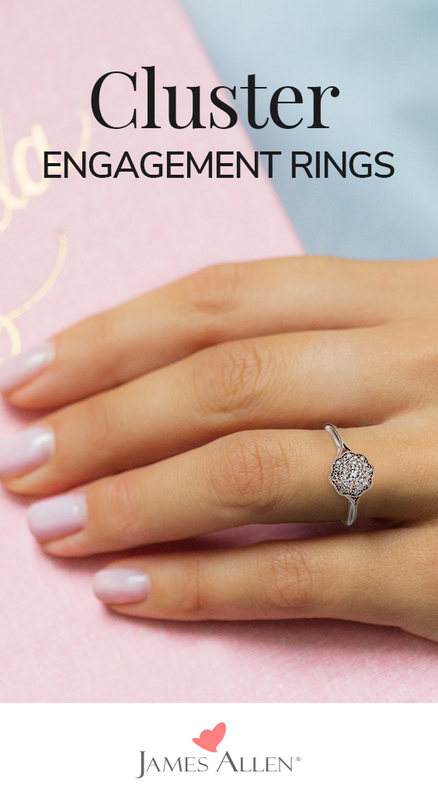 The ring is preset with a cluster of brilliant diamonds that add a touch of whimsy. Can’t decide between old and new? You don’t have to with a Vintage-Inspired Floral Bouquet Engagement Ring that puts a modern twist on an antique style. Inspired by falling leaves, this petite ring packs in a cluster of round brilliant diamonds surrounded by exquisite milgrain detailing. This breathtaking Royal Halo Bypass Swirl Engagement Ring features a bouquet of diamonds with the brilliance of a diamond twice its size! The pavé crossover split shank finishes off this superb design with a flourish. Cluster engagement rings date as far back as the 18th century, when diamonds were typically set around a center stone in a loose, almost crowded manner. By the early 20th century, halo settings had taken on a more orderly form, with diamonds positioned more precisely around a center stone. While halos tend to appear more linear and clusters more crowded, the difference is so subtle that the terms are generally interchangeable. Whatever you choose to call them, these super-sparkly rings are a wonderful throwback to a bygone era of romance and charm. Sparkle is timeless, but this Pavé Crossroad Engagement Ring bears a striking resemblance to an old-world timepiece! From its pavé-encrusted rectangular frame to the beadwork in the shank, this retro-style stunner is one to watch. 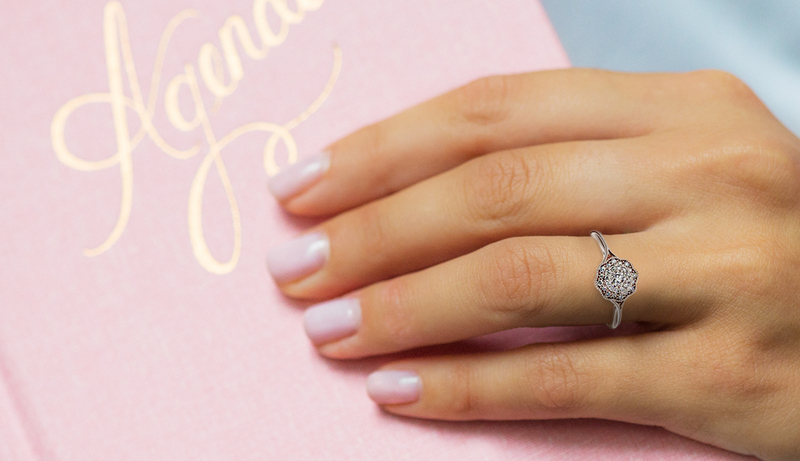 Welcome this preset Floral Embrace Engagement Ring into your life with open arms! Delicate milgrain and a scalloped pavé halo frame the brilliant diamond cluster within. A slim-pinched shank gives the ring its classic-yet-modern appeal. Not one for ostentation? Try this Tapered Cathedral Engagement Ring on for size. The slightly rounded, pavé-adorned shoulders cascade gently from the center cluster of diamonds, creating a look of understated elegance. Looking to supersize your sparkle? Delve into these classy cluster rings in 360° HD. Let us know which diamond constellation has caught your eye in the comments below or over on Instagram, Facebook, or Twitter.